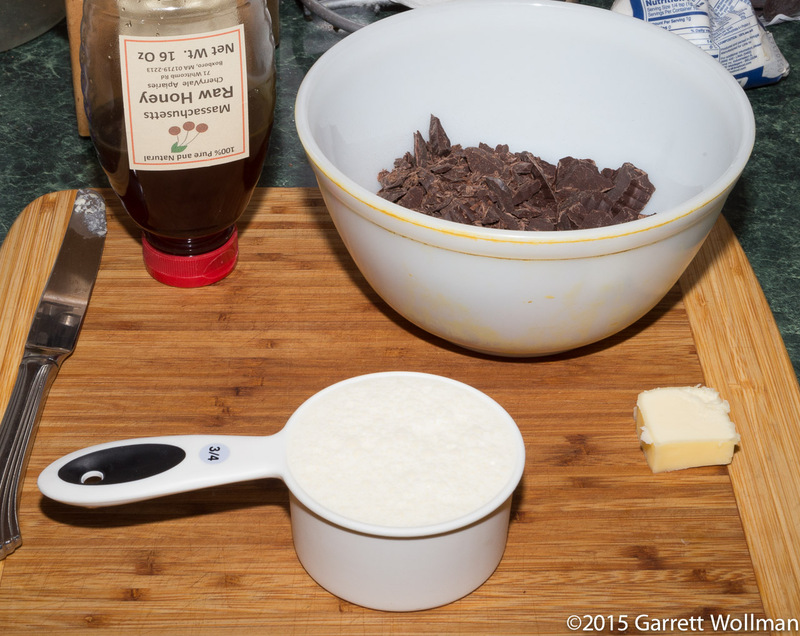 Now we come to two brownie recipes that were real disappointments to me. First up, from Moosewood Restaurant Book of Desserts (ascribed to “The Moosewood Collective”, copyright owned by Vegetable Kingdom, Inc.; Clarkson Potter, 1997) are “Hazelnut Brownies” (p. 198), which were not bad, but not as good as I was expecting. The second recipe, from Fritz Knipschildt’s brand-new cookbook Chocopologie , was much worse. Both recipes suffered from the imprecision of not giving flour quantity by mass, but the difference (as much as 25% depending on how you measure) is far more apparent in the Knipschildt recipe, with three cups of flour, than in the Moosewood recipe with a more manageable half a cup. 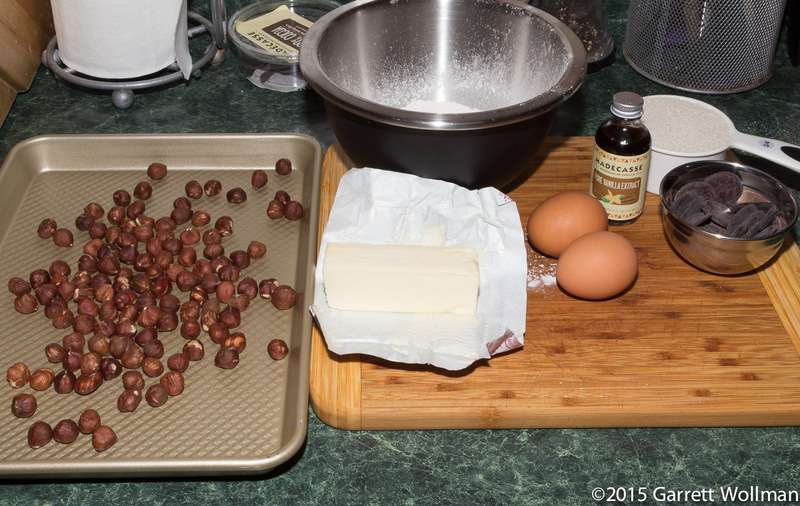 Starting with the Moosewood “Hazelnut Brownies”, the ingredients here are fairly standard, except for the natural hazelnuts, which are sitting on a quarter-sheet pan waiting to be toasted. Moosewood uses the traditional (and now somewhat underwhelming) 2 oz of unsweetened chocolate; by this point I had run out of the TCHO unsweetened and instead used an unsweetened chocolate processed in Madagascar by Madécasse. The recipe calls for “white flour”, and according to notes elsewhere in this cookbook, they use this to indicate that either all-purpose or pastry flour will work, so I used pastry flour. Preparation is by procedure #2 (as described in part 2 of this series). After baking and cooling the brownies, a ganache is spread on top and then the brownies are chilled to set the topping. The recipe says “chopped semi-sweet chocolate or chocolate chips”, and since my stock of Callebaut 54% was reserved for another recipe, I used Guittard 63% bittersweet chocolate chips. Unfortunately, this chocolate did not react all that nicely to refrigeration, leading to the unsightly bloom shown in the photo above. It didn’t really affect the taste, however. Of course I ate a serving. You can see clearly in this cross-section the ground-hazelnut bottom crust, the brownie cake itself, and then on top, the ganache topping (which this recipe calls a “glaze”); I wonder if it would have been better whipped, as is usually done for ganache-based frosting. 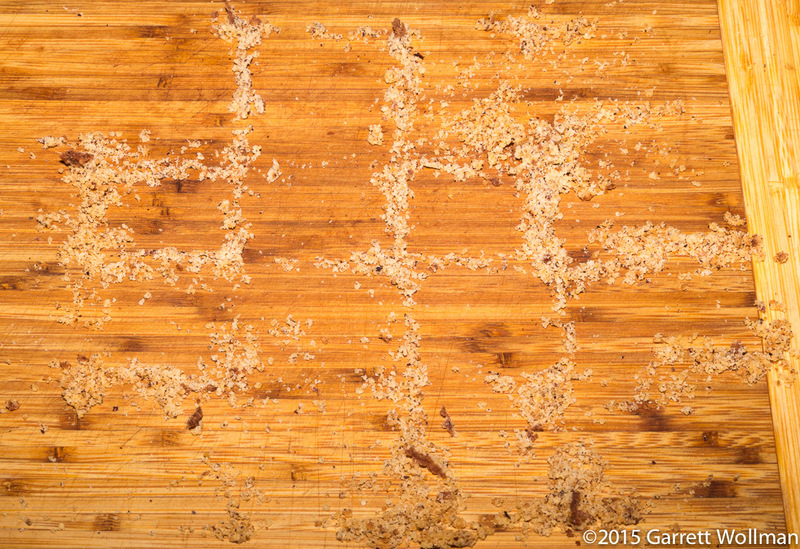 After portioning, a significant amount of the hazelnut crust was left on the cutting board. 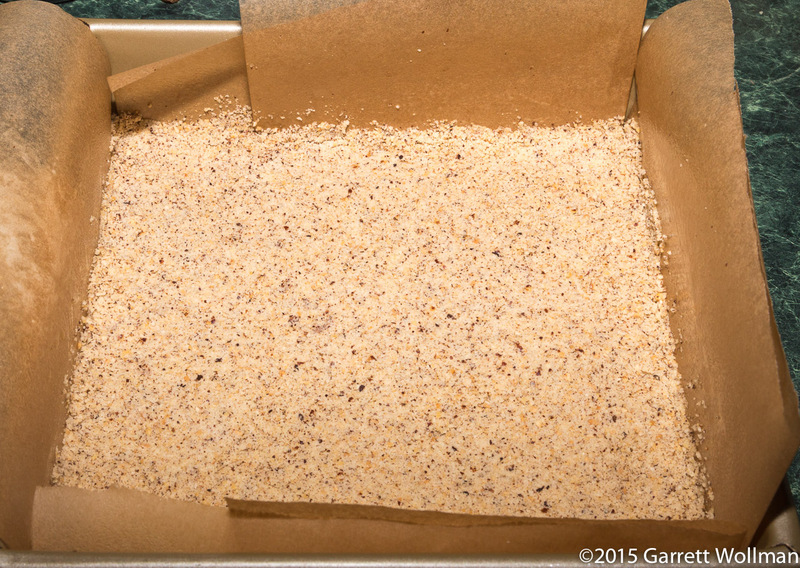 This makes me think that the recipe could be improved significantly by making the bottom crumb-crust-style rather than just pressing ground nuts into the pan. Fritz Knipschildt is a well-known Connecticut-based chocolatier, and for a while he operated a cafe attached to his production facility. For that reason, I had high hopes for “Fritz’s Fudgy Brownies” ( Chocopologie , Houghton Mifflin Harcourt, 2015; p. 36), but the results were less than splendid. As I noted in the introduction, the recipes in this book give no hint as to the quantity of flour in a “cup”, and that can vary by as much as 25% depending on how you measure — and when a recipe calls for three whole cups of flour, 25% is quite a lot. For recipes like this, I usually assume that the recipes were tested with 5-ounce cups (the result of the “dip and sweep” method, which packs more flour into a measure than spooning), but that turned out to be a mistake. One unusual feature of this recipe, which I actually really wanted to try out, was its use of raisins as an optional alternative to the traditional walnuts, so I might do this recipe again with 4-ounce cups just to see if it comes out any better. The chocolate here is 6 ounces of Callebaut 54% semisweet (the recipe, oddly, calls for “semisweet or bittersweet”) in the brownie proper, and an equal amount of the same chocolate in the ganache topping. 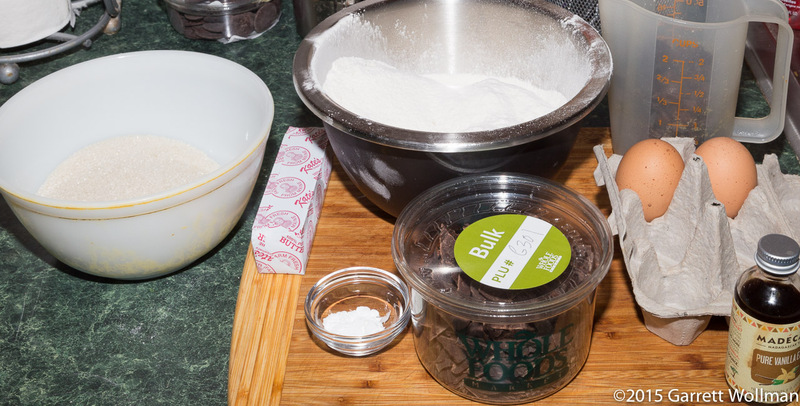 (In a redo I would use a higher-strength chocolate, since Knipschildt doesn’t seem to think it matters, and I prefer stronger chocolate flavors — but I’d expect the effect of the flour to dominate anyway.) I used leftover extra-large eggs, figuring that there was enough flour here to absorb the extra liquid (and boy, was there). The dough — it’s much too stiff to be called “batter” — is assembled using procedure #2 (as described in part 2 of this series); I had to press it into the pan using my hands to get it sufficiently even for baking, and you can see the result even after baking. Good thing it was going to get covered by a ganache! Unusually, Knipschildt’s ganache calls for a tablespoon of honey and a tablespoon of butter in addition to the usual cream and chocolate. As noted above, the chocolate is another 6 ounces of Callebaut 54% semisweet. After spreading the ganache on top and allowing it to set, I cut myself a serving (and of course portioned the rest of the bar as well). 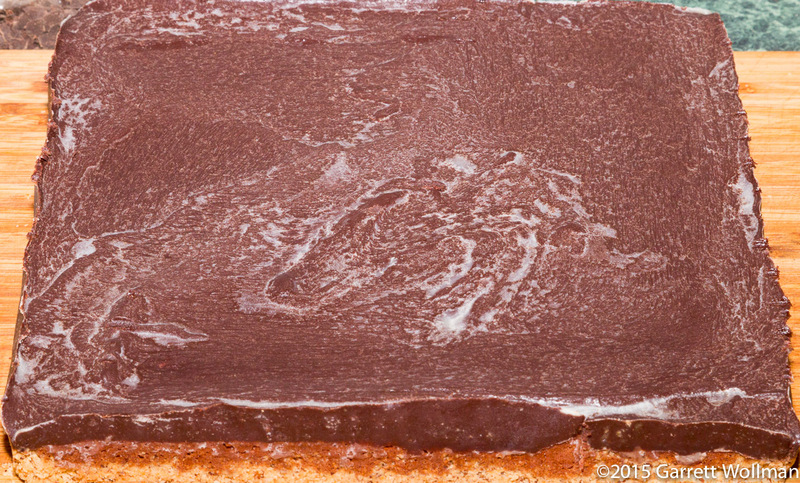 You can see from this cross-section how pale the crumb of this brownie looks — even compared to the relatively low-strength ganache frosting on top. So too was the taste: not nearly as chocolaty as it ought to have been for the amount of chocolate used, since it was diluted so much by the flour. Unsurprisingly, “Fritz’s Fudgy Brownies” scored poorly across the board, with ratings below average (n=5) for all categories except “topping”, and a 2.7 (on a 1–5 scale) for “overall impression”. Moosewood’s “Hazelnut Brownies”, despite the issues with the bottom crust and the bloom in the ganache topping, scored significantly better, with 3.5 overall (n=6), landing in ninth place despite a below-average showing in the “moistness/mouth feel” category. Neither recipe received any “favorites”. Neither of these recipes contain any added salt, and as a result, qualify as “A Very Low Sodium Food” under FDA regulations. They could probably have used some. Reflects the use of 15 oz of flour, Callebaut 55% semisweet chocolate block, and extra-large eggs. Your mileage will certainly vary. 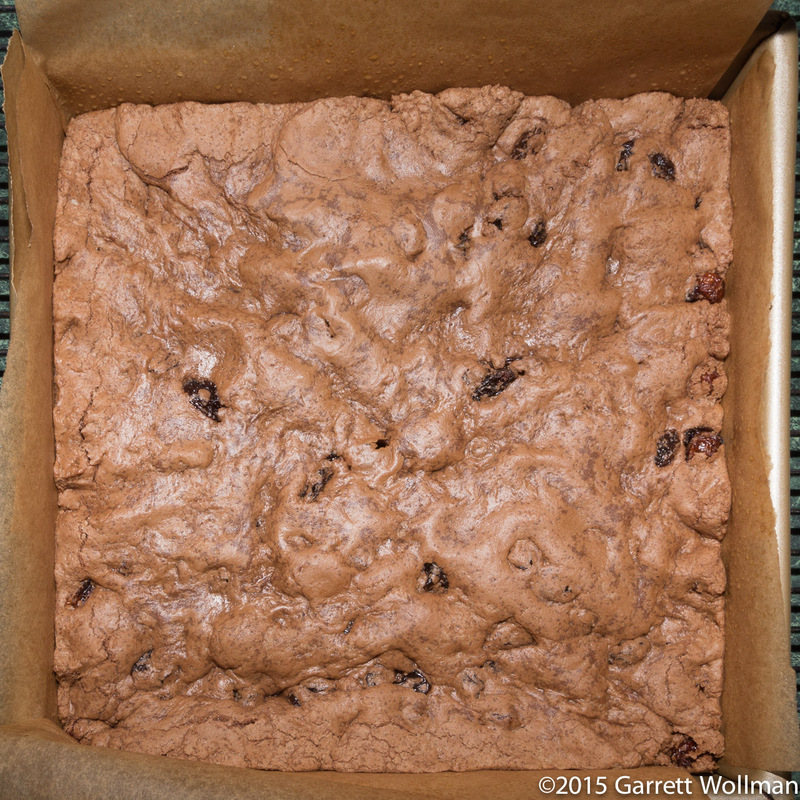 This entry was posted in Food and tagged browniefest, brownies, chocolate, Fritz Knipschildt, hazelnuts, Moosewood, recipe. Bookmark the permalink.